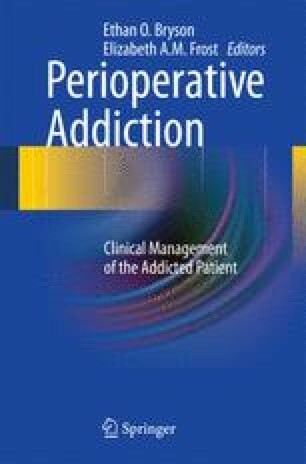 While there is extensive literature regarding anesthesia for the actively addicted patient, there remains very little to guide the perioperative management of the patient in recovery. Developing a better understanding of the unique needs of the patient presenting for surgery who is in recovery from chemical dependency is essential for those involved in the perioperative care of such patients. Some of the issues that arise in this population are similar to those that confound the management of the chronic pain patient, such as tolerance, opioid-induced hyperalgesia, and withdrawal. In addition, many patients in recovery are maintained on methadone and buprenorphine, which can further complicate their perioperative management. This chapter will discuss pain management strategies involving alternatives to opiates, recommendations for safe use of opiates and other “triggering” agents, and relapse prevention. For the purpose of this discussion, the term “addict” will include persons addicted to alcohol.